Huntington Beach is a city located in the territory of California. It is located in Orange County. The population is about 190 000 people. Huntington Beach is known for its almost fourteen kilometers long beach. This is one of the favorite places for surfers from around the world. Thousands of years ago in the place where today the town of Huntington Beach is located, lived the Tongva tribe of Indians. In 1784, Spaniards appeared in the area. The first one was a Spanish soldier, Manuel Nieto, which received a donation of one thousand two hundred square miles as a reward for his military service. He founded the Rancho Los Nietos. Huntington Beach has had many names - among them Shell Beach, Smeltzer, Gospel Swamp. It was then known as Fairview, Pacific City. Gradually the town became a favorite destination for many Americans because of its beautiful beach. Its name was eventually changed to Huntington Beach on behalf of railroad magnate Henry Huntington. 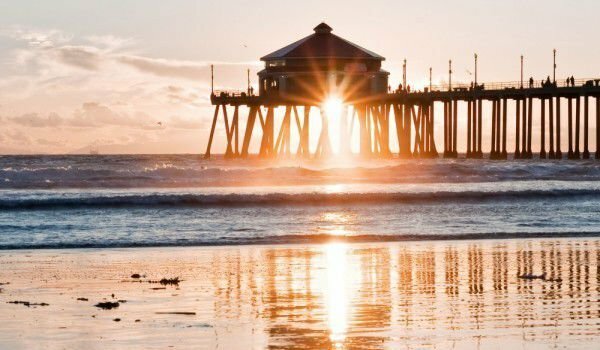 In 1909, Huntington Beach was recognized as a city. An encyclopedia company was selling cheap plots of land - 126 dollars for one. The happy new owners of the land were even more happy when it turned out that there is oil there, and in large quantities. Initially, Huntington Beach was an agricultural community, and there were grown celery and sugar beet. The first university in the city was built in 1906. On the beach in Huntington Beach is prohibited construction of any building without residents having first voted in the city. Between the port and the center of Huntington Beach is Huntington area which is within the ecological reserve Bolsa Chica. To restore the ponds in the reserve, one hundred and ten million dollars have been invested. The reserve is a favorite of many photographers who arrive from all over the country to photograph rare birds here. The north and south beach - Bolsa Chica and Huntington Beach are state parks. Only the central beach - Huntington City Beach is managed by the city. Camping is prohibited on most of the beach and places where you can camp, must be booked months in advance. Many of the events in Huntington Beach are happening on the beach. There is the opening of the surf season in the U.S. On the beach competitions are held regularly in beach volleyball and biathlon - race and swimming. Since 1904 in the city is held a parade for the Fourth of July. Every September, in the city is held a festival of independent film productions. In winter competitions are conducted by boats that are in bright colors. The annual Festival of Kites is held in late February. The town regularly conducts road marches, one of which presents beautiful vintage cars. Every Tuesday at the beach, surfing takes place at night. This continues throughout the year. During the night surfing, you meet many people and it becomes a real bright event that feels like a festive carnival atmosphere. In Huntington Beach, world surfing competitions are held - it happens every summer. Huntington Beach is known as a surf town.